Comics In 5 Panels: Manga-Mania May: Genkaku Picasso. 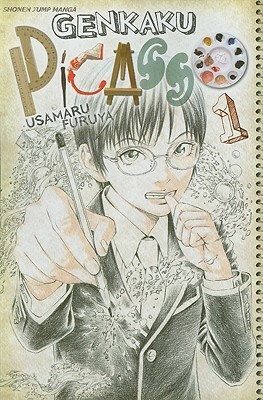 Hikari Haruma, also called Picasso by his classmates(much to his annoyance) is a loner in his school by choice. He has no interest in making friends, gets annoyed very quickly, and use the most of his time to draw pictures. The only friend he has is a girl named Chiaki(mostly because she insist on hanging out with him). One day, Picasso and Chiaki are the victims of a helicopter accident, with Picasso miraculously being the only survivor. Picasso gets depressed over the lose of Chiaki, but one day he finds a tiny angel-Chiaki in his pocket. She explains that she saved Picasso by praying to God or Buddha for his life (remember kids: pray to as many gods as possible), and therefor he was spared. BUT there is a condition: Picasso must now help humanity. Picasso, slightly confused, finds that he has the ability to see the aura of people in pain, then draw a picture that represent that pain, and travel into the persons soul by the painting to try and see if he can help that person. This story mainly has it's focus on the pain you do not see. People who at first seems like they are doing fine, but actually just hides behind a facade to prevent others from seeing how hurt they actually are. So a lot of scary stuff is going on in this series, like when Picasso finds out by his new ability that one of his classmates named Sugiura wants to kill someone randomly. This is serious dark stuff, very obscure, and possibly even disturbing, when Picasso and Chiaki travels into the soul of whoever has the aura of pain, but I can promise a happy ending at every story. I have a problem with the artwork, though. Not that it's bad, it's just that the faces of pretty much everyone in the series kinda looks like girls. But this is a minor problem, if a problem at all. Bottom line: I highly recommend this little story, that is, even among manga comics, pretty unusual.